Plays about climate change are all the rage right now, it seems, and if the National’s Greenland was a little dry and statistic-heavy for your taste, you’ll be pleased to find the Royal Court’s efforts a lot more passionate and character-centred. Dr Diane Cassell is the heretic of the title. A climate scientist and lecturer at York University, as well as a decided sceptic, her cynicism is making enemies of those around her, not least the Sacred Earth Militia, from whom she is receiving death threats. Juliet Stevenson gives a perfectly pitched performance as the unconventional heroine who sees herself as a Galileo figure in a world where green activism has become something of a religion. Flouncing around as her precocious, anorexic daughter, Lydia Wilson brings an underlying emotional desperation to her role that is as touching as her feigned indifference to love interest, Ben (a beautifully ingenuous Johnny Flynn), her mother’s young protégé. Director Jeremy Herrin knows a thing or two about how to hold his audience and the 2 hours and 40 minute running time races by. Richard Bean’s intelligent and uproariously funny script is skilfully constructed to reel us in and tug us this way and that. Tension is managed expertly: an excruciatingly dangerous moment in the second half has the audience audibly fretting in apprehension, only to briefly let us off the hook before swerving swiftly in the direction of a completely unexpected, but no less dramatic conclusion. Like its well-developed characters, Bean’s play is multi-dimensional: it’s about science versus politics and the corruption that inevitably ensues, as well as being a family drama and a love story. It even finds time to comment on eating disorders and poke fun at the bureaucracy of the education system. But above all this, it’s the complexity of the characters and their relationships that are the focus here and that bring depth and humanity to the play’s discussion of these all-important and provocative issues. The Heretic will run until 19th March at Royal Court Theatre, 50-51 Sloane Square, London SW1W 8AS. 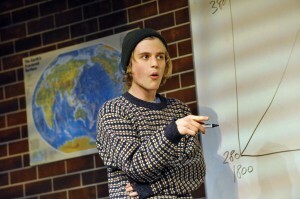 Production shot by Keith Pattison, featuring Johnny Flynn (Ben) in The Heretic.